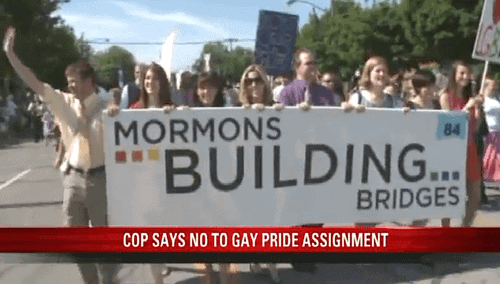 The officer, whose identity has not been released, reportedly cited religious convictions in asking for reassignment rather than participating directly in the parade — an act he saw as an endorsement of last Sunday’s Utah Pride Parade. His lawyer, Bret Rawson, said the officer did not — as initially indicated by SLCPD officials — refuse the [motorcycle] assignment, and would have ridden in the parade had he been ordered to do so. "My client has made it clear to SLCPD that he is not returning," Rawson said Tuesday. "He feels he has been subjected to needless ridicule by the department for merely expressing a desire to work the parade without participating in the parade. The Salt Lake City Police Department declined to provide further comment on the situation or any pending litigation. When the initial story broke about the SLCPD indicating that a police officer had flat-out refused to work at Gay Pride, Maggie Gallagher blasted the cop, writing: "Religious liberty should not extend to a cop refusing to protect Gay Pride parade-goers — that is just wrong." I do not think cops have a right to refuse to serve and protect gay people or gay institutions, but if government can punish you for merely asking for an accommodation, we are in serious trouble. I trusted the police department as a reliable source (my biases showing! ), but if the cop’s story is true, he has a number of serious legal claims, from the First Amendment to defamation of character. What are your own thoughts on the case? Do you think, like Rawson, that the SLCPD gave a "knee-jerk reaction" to the officer's concerns by immediately putting him on administrative leave?